The Brooklyn Botanic Garden is an oasis in the midst of the busy day-to-day of New York City. Brooklyn Botanic Garden Wedding Photos are always exceptional, with every season offering up something magical to behold. From the beauty of the Bluebell Wood in the spring, to the vibrant foliage of the fall, Brooklyn Botanic Garden wedding photos are awash with color and life. The garden is a beautiful place for both ceremonies and receptions. At this location, couples can choose to say their vows within the glass, wildflower covered walls of the Atrium, followed by a celebration in the mystical setting provided by the Palm House. The photograph above shows a couple who opted for a late-spring wedding. 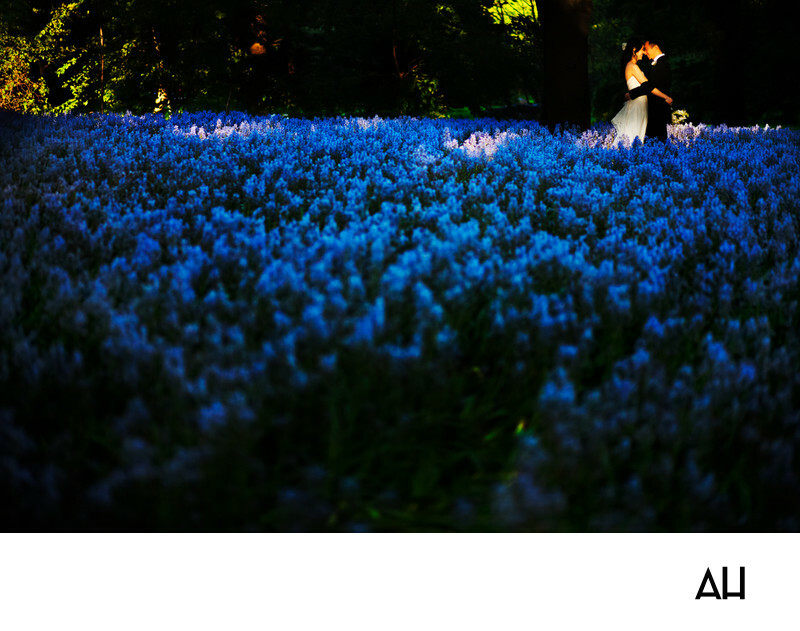 The image depicts the couple together under the stars, in a riotous sea of bluebells. It shows the affection and devotion the bride and groom have for one another. They stand out amongst the blue of the flowers in their classic white and black, and for this moment they could be the only two humans on earth. The pair holds one another in a casual, yet loving embrace that signifies how comfortable they are together. The bride rests her forehead against the groom’s, and their noses brush in an Eskimo Kiss. The image is endearing and the smiles on faces of the newlyweds are contagious. It is a moment of utter joy, between two people who have vowed to spend the rest of their lives together.